Liverpool have confirmed the permanent departure of Dominic Solanke with the Englishman having made the switch to the South Coast with Bournemouth. The young marksman has experienced a difficult season where he has failed to earn a single appearance for the Reds in any competition and this has eventually witnessed him join the Cherries for a reported fee of £19m. "@DomSolanke has sealed a permanent transfer to @afcbournemouth. Everybody at #LFC thanks Dom for his contribution to the Reds and wishes him the best of luck for the future," Liverpool wrote on their official Twitter account. 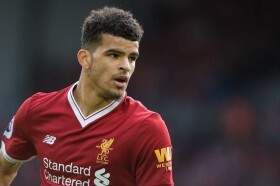 Solanke has been struggling with a groin problem which has kept him sidelined for the past few months but the Cherries have nonetheless taking the option to recruit the striker. The arrival of the 21-year-old is expected to coincide with the departure of veteran striker Jermaine Defoe, who has supposedly agreed to join Scottish giants Rangers on an 18-month loan deal.